Payrolls were up 162,000 last month and the unemployment rate fell to 7.4%, the lowest it has been since December 2008. The report shows continued improvement in the job market, but at a rate that remains moderate, in keeping with an economy that is reliably expanding but has yet to really accelerate. The report, like many of late, contains good news and less good news. Most of the decline in unemployment was due to more people getting jobs but part of it was due to a slight fall off in the labor force, a signal of not-too-strong labor demand. The participation rate ticked down one-tenth, to 63.4%, lower than it was a year ago (63.7%). Also, May and June payroll gains were revised down by 26,000. Average out the monthly ups and downs, and payroll gains have been delivering a steady 175,000 to 200,000 over the past year. Another way to see the very steady pattern of current job growth is to look at the year-over-year percent change. 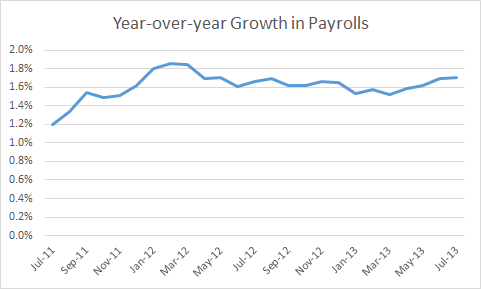 By this measure, payrolls have grown in a very narrow band between 1.5 and 1.7 percent every month for over a year (since April 2012), a remarkably steady flow (see figure). Most industries added jobs last month, though manufacturing, which was expanding earlier in the recovery, has hit a soft patch, adding 6,000 jobs in July, after declining slightly in the prior two months. Over the past year, factory employment is up only 18,000. The fact that the trade deficit, largely comprised of manufactured goods, took 0.8 percentage points off of first quarter GDP growth is implicated in this slowdown in factory jobs. Retailers added 47,000 jobs and restaurants and bars added 38,000, as consumer spending continues to support the moderate growth in service employment that’s characterized recent reports. Construction was off 6,000 last month and has hit a flat patch over the last three quarters, though the sector is up 166,000 over the past year, as the housing market has started coming back to life. Government employment was flat overall last month, but state and local governments have slowly started adding jobs in recent months, up 42,000 since January. Weekly hours ticked down slightly, and weekly earnings are up in nominal terms by 1.9% over the past year, about the rate of inflation, meaning paychecks are pretty flat in real terms. All told, today’s jobs report is quite consistent with both recent job reports and the underlying pace of real GDP growth. We’re growing, but at a pace that is only very slowly absorbing the slack that remains in the job market even as we’re four years into the expansion that began in the second quarter of 2009. We’re adding jobs at a reliable rate in most industries, supporting moderate wage growth that’s keeping pace with prices. It’s an economy and a job market that’s stuck in second gear. That’s a lot better than reverse, but it’s a far cry from the speed limit.